I mean most people HERE don't know that Mardi Gras has a flag. Regarding the concept, I like it. I think the moon could use a bit more refinement, and I'd like to see the fleur de lis incorporated in a different way. They just kind of look thrown in there right now. But a very good start. Using the comedy and drama masks was a nice choice. I know it doesn't really matter now since you worked out your back story for the team, but "krewe" has been around since the late 1800s with the term first used by the Mistick Krewe of Comus. I'm not a huge fan of the name Krewe, but those uniforms are beautiful. First of all, thanks for the help with the etymology of krewe. Merriam-Webster says that the first documented use of the word was in 1936, which is bizarrely and obviously wrong. Maybe Krewe used to refer specifically to that group, but eventually came to mean any formal, private Mardi Gras organizing committee; sort of like how Escalator used to be a company, but now it is a generic term for moving stairs. Or maybe M-W needs a new etymologist. It's interesting either way. What do you mean by refinement for the moon? Change its shape, add texture? The primary reason that I added it to begin with was that I wanted to use all three colors in the logo. I messed around a bit and came up with several different variations on the logo. What do you think? Option 7: Masks, moon, and three fleurs de lis in a triangle. I still prefer the first one. By refinement I basically meant to work on the curvature/shape of it. The inner and outer curves don't appear to be consistent all the way around. I think they can be tweaked a bit. Of the different ones you threw out there, I still think the first one is the best option....but I still don't care too much for how the fleur de lis are used in the logo. I wish I could think of a way to position them better, but I'm coming up with a blank right now. I redid the crescent, and have another arrangement for the fleurs de lis. Much better on the crescent. I think I like the new arrangement better. Nice job. Agreed. The new arangement looks great. Then I guess that's New Orleans. Thanks for all the feedback. 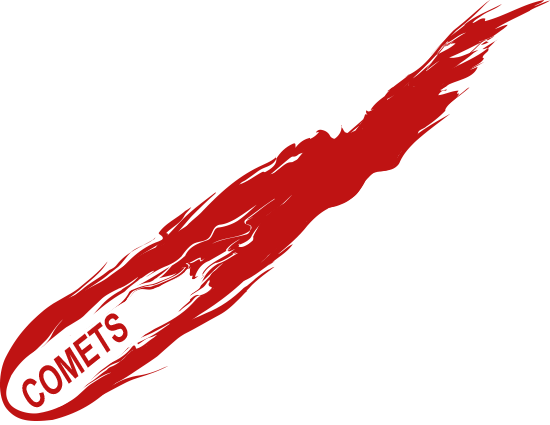 Next up is the Los Angeles Comets. 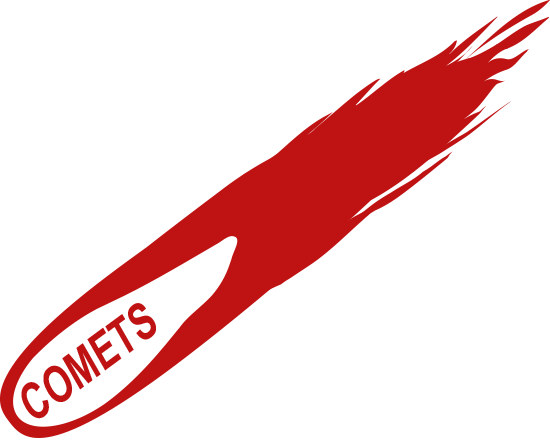 The team was founded in 1927, and took its name from Comet Pons-Winnecke, which was highly visible the summer before the team began competing. They have enjoyed a tremendous amount of success, winning 3 PFL titles since the league resumed play in 1946 (1946, 1949, and 1951). The Comets joining the league also created a notable milestone for minorities in the league. Their quarterback, Lawrence Rhodes, became the first Black starting quarterback in the AFA. The uniform is pretty simple. The only mark is the roughly comet-shaped mark on the helmet. The inspiration for which is the 1952 Dallas Texans helmet. It's a simple, boring uniform, but somebody had to have one. I like the comet logo but I'd like to see a more organized inner white section, just to see how it compares. As you wish. In my rough draft, both the head and the tail were more stable. For this, I just moved the rough version of the head onto the final tail. Just for another reference point, I also made one in which the tail is more of a fireball. Okay, thank you. I prefer the original. I think the Comets are outstanding! But the 2nd choice is too 1990's. Keep up the good work man! 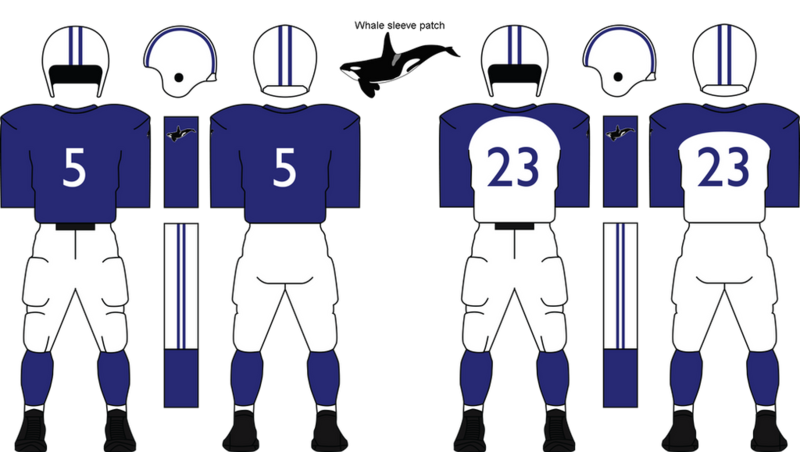 The final team transferring to the AFA for the 1952 season is the San Francisco Whales. The Whales began play in the Pacific League in 1936, and was the only Depression-era expansion team to survive for more than two seasons. Since WWII, they have found success in the Pacific League with a fast, aggressive defense and an exceptional power run game. The logo isn't quite finished yet, but I wanted a bit of feedback before I put any more time into it. I used a more traditional crest-style logo with a great degree of detail, which allowed me to include the Golden Gate Bridge as a symbol of the city. The one thing that I really dislike about this is the splash. I've been working on this for nearly a month, and I've tried a dozen different ways of drawing it, but I don't like anything. If anybody has any suggestions for how to do this, I would appreciate it immensely. If this turns out to be an acceptable logo, I will redo the text by rotating the letters individually, as it would have been done at the time. I'm just not interested in taking the time to do it if I'm not going to end up using this at all. The uniform includes several unique features, most notably the whale patch on the left sleeve. It is meant to look like it is swimming through the blue on the jersey, which is why I kept the blue sleeves on the away uniform. They are also the only team in the league that doesn't wear standard block numbers (for now). As was the case with the Bears in the NFL, I expect this to remain the case for quite a long time. With the 1952 expansion, divisions were redrawn, and rules for scheduling were changed. 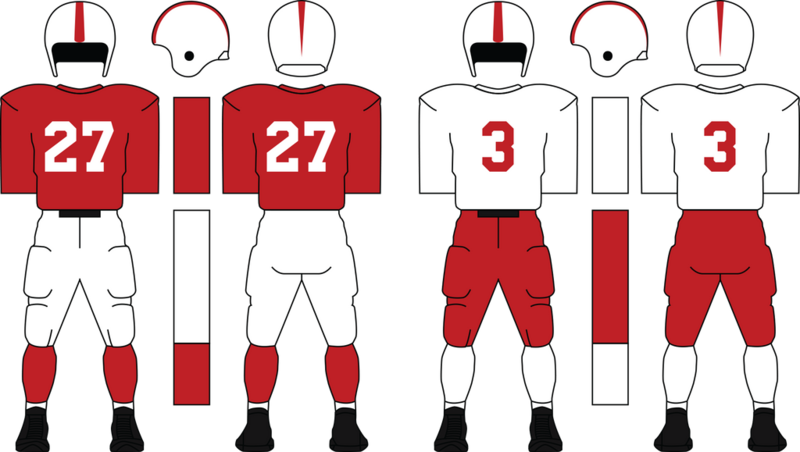 With 16 teams, the AFA created four divisions (listed below). In a given season, a given team would play each of their divisional rivals twice (6 games); every team in one division, which rotates annually (four games), and one game against each of the two remaining divisions, determined by the previous season's standings (two games). The winner of each division advances to the playoffs, where they are seeded 1-4 based on their winning percentage (ties count as half of a win). In the semifinals, the top-seeded team hosts the fourth seed, and number two hosts number three. The winners advance to the AFA Championship Game, which would be played at a predetermined neutral site, with the higher-seeded team technically considered to be the home team. Over the next two seasons, no team made any design changes. The 1952 season produced some unusual results. Baltimore posted the first winless record in AFA history, and was defeated by double digits in all but three of their games. 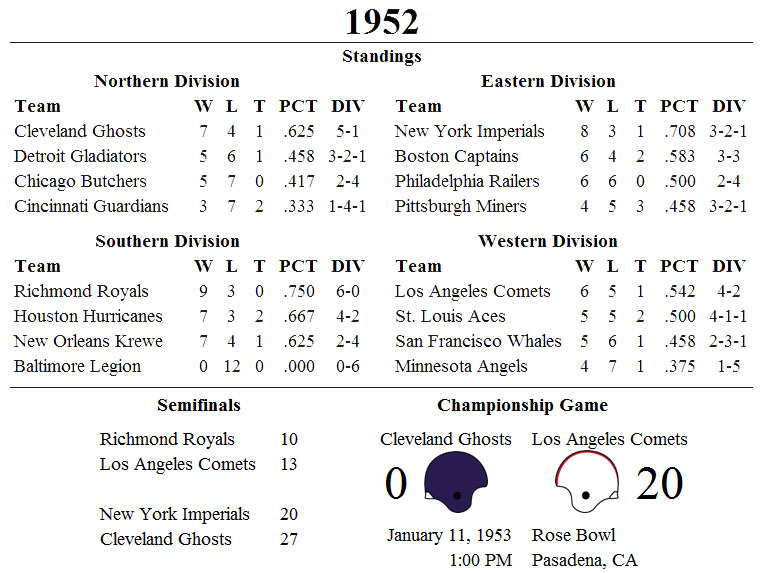 Richmond, New York, Cleveland, and Los Angeles won their divisions, but the playoffs began under criticism. Three Southern Division teams won at least 7 games, while Los Angeles, who won the West, won only 6. Many people, particularly Houston fans, complained that the four best teams should make the playoffs, regardless of division championships. These complaints, which were based on the idea that Los Angeles wasn't good enough to compete in the playoffs, were dealt a strong blow when the Comets stunned the top-seeded Richmond Royals in the semifinals. They went on to face the Cleveland Ghosts in the finals--a team that had won an equally surprising victory over the Imperials in New York. Interestingly, 1952 was supposed to be the first season in which the Championship Game would be played on a neutral field. However, as part of the agreement that brought the Comets into the league, the game was held in Pasadena, only a few miles away from the Comets' home field (though they were officially considered to be the visiting team, as they has a lower seed than Cleveland). In front of a friendly crowd, the Comets stomped the Ghosts 20-0, the first postseason shutout in AFA history. 1952 also saw a major milestone for African-American players. In October, Lawrence Rhodes became the first black quarterback to start a game when he started for the Comets in their season opener against St. Louis. just three months later, he became the first black QB to win an AFA Championship. The 1953 season was marred by severe injuries to several players, primary among which were two superstars. Cleveland Ghosts LT Norris Rivers, an 8 time All-Star, suffered a gruesome, career-ending knee injury in week 8 (at the age of 26). However, even more prominent was an injury to New York QB Charlie Kadlec. In the third game of the season, he took a helmet to the face, which knocked out several teeth and broke his jaw. The break became infected, and Kadlec nearly died. He missed the rest of the season as New York failed to secure a winning record for the first time since before World War II. As a direct consequence, the AFA made added single-bar face masks to the helmets for the 1954 season. Baltimore, who had posted an 0-12 record in 1952, came back even weaker in 1953 as most of their star players demanded to be traded. Once again, they failed to win a single game, though they did manage to improve to 0-10-2. By the end of the year, fan support was so low that their stadium was less than half full for their final game. Unsurprisingly, it was announced that the team would fold. Unlike in many previous years, there was no clear favorite for the championship. St. Louis won 10 games, which clinched the top seed for them in the playoffs, but Boston (8-4) defeated them during the regular season, and suffered three of their four losses during a four game stretch when QB Greg Motta was sidelined with an injury. St. Louis was nearly upset by Houston in the semifinals, but secured a trip to the championship game with a last-minute field goal. Boston, on the other hand, crushed Detroit 31-13 on their way to Baton Rouge for the title game. Both teams played well, and at the end of regulation there was a 13-13 tie. In overtime, both defenses held strong, as each team went three and out twice, before St. Louis returned a punt to the Boston 45 yard line. Two plays later, QB Buzz Napper hit WR James McCollough down the sideline for the game-winning 42 yard touchdown. After going 0-22-2 over two seasons, the Baltimore Legion have folded (I did the math, and given their talent level and schedule, the probability of them failing to win a single game was about 1 in 10,000). To replace them, the league granted a new franchise to an ownership group based in Washington, DC, who have chosen to call the team the Wasps. All of Baltimore's contracts will be transferred to the Wasps, and there will be an expansion draft which will allow the team to hopefully fare better than their predecessors had. I can't get the uniform to upload right now, but it should be up shortly. Here is the uniform. The template changed slightly to include the new facemask. Rather than reposting every team to include the masks, I'll just do a single post with every team's helmet alone (once I make sure that I'm happy with the template itself). Incidentally, I would love feedback on the template as much as the uniform. I went with pale gold rather than the color in the logo to create more difference between Washington and Pittsburgh. 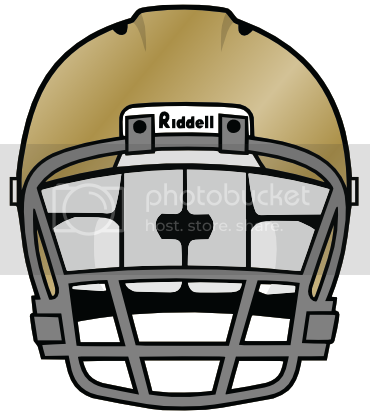 The helmet is meant to be metallic, like Notre Dame's; I just haven't been able to figure out how to make that apparent. The Wasps look fantastic. Their logo really looks like it could have been taken straight from a real 1950s football team. I also like the uniforms. You really seem to have a unique look for each team. (I particularly liked your Wheeling Miners set). I am a fan of your template as well. Maybe once you get to the present day, you could try something with a photo-realistic template, but the one you have now is fine in that it puts the focus on the uniform itself and presents that effectively. As far as metallic helmets, one way to do it is to use a diagonal gradient. (Click here to see a rough mockup). I used five gradient stops and alternated between the color of the helmet and a color slightly darker than the intended color of the helmet. It's not perfect, but it conveys the idea. Your logo skills have improved significantly since the beginning of this series. I have enjoyed your work immensely and am looking forward to seeing this get to the present day. It's a shame this series hasn't gotten much recognition; it deserves far more than it's received. The asymmetry of the abdomen is jarring to the eye. And I don't get what's going on with that textural overlay--it would be good to see the logo without it. That said, good job on this series so far. You've obviously put a lot of thought into this in trying to mimic bygone eras. Keep it up.